Simply Anchored: My Lost Post Magically Reappeared! My Lost Post Magically Reappeared! A few weeks back I had blogged about how I had written a post and how it disappeared after using the Blogger app. Yeah I was a little less than thrilled. So I was going through and looking at some of my draft posts and decided to click on this one since I was going to delete it. Well by golly looky who decided to show up to the party in whole about 2 weeks late. My entire post! Where the heck in cyberland did you run off too? How many drinks did you have before decided to return to my little corner of the world? So here it is folks - the lost post I rambled on about. Tonight my husband and I decided to go out for date night, well technically date 'day' since we started our date at 1:00pm. It has been a while since we have done anything sans baby that didn't have to do with running errands or on his boat (which is work for him). We decided last night that we should do dinner and a movie, or vice versa. Which was perfect since I had been wanting to see Gravity since it came out and I am sick of cooking! I texted my mom last night to see if she would take over baby duty for a few hours and she hopped at the chance. So we got ourselves together, dropped him off, went to Bed Bath and a Beyond, got a SodaStream (more on that here) then hit up the movie. Okay my husband wasn't too keen on the movie, finding out after that he already read the entire spoiler for it so he was bored. Sucked to be him, because I was on the edge of my seat the entire time. Then we headed off to dinner, after a quick phone call to grandmas to see how our boy was doing. And of course he had been perfect (he always is for her...stinker). Dinner was delicious. We chatted about baby, house buying, and random Facebook gossip that we are happy to be spectarors at and not game players. So back to the quote. 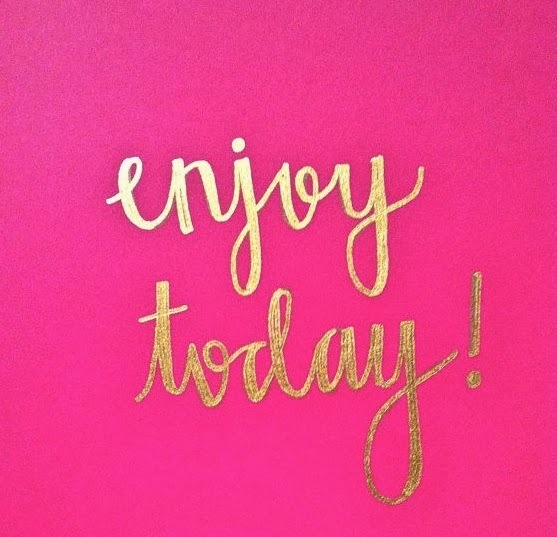 I got to thinking that we are so busy worrying about tomorrow that we forget to enjoy today. We could have easily been worried about plans for this week, errands we need to run, bills we need to pay, but instead we decided to slowdown and worry about the moment we were in....and enjoy it. It was good to be out with just my husband. But once we brought my boy home we had an amazing time just playing on the floor and laughing together. 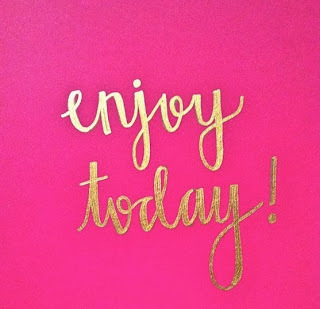 So for today, keep in mind to enjoy it. Even if it is a crappy day, find something small that you can enjoy. There is always something good in every day. I hope your day date went well! It's so important to have those dates! I've been curious about the sodastream. I'm gonna check that out next! wow, I hope this happens to me too! I also lost a post composed on Blogger App on iOS, I still haven't managed to find it. >< I may also have to wait two weeks!